This seems to be an ancient four-wheel tender, the body of which is rusted through in several places. Written on the back is: ‘Different framing shapes (or ’shaped) and rear. Southern Division built by Brassey of Canada Works‘Birkenhead. L. Ward.’ But what engine has it come off and what other details can anyone add? The late Laurie Ward was an ardent enthusiast of the North Eastern Railway, so I am guessing that the Southern Division refers to the NER. This is rather off-topic but it sounds like the photo may be off-topic for the LNWRS too! I remember Laurie Ward well, as I expect others do too. I believe he was a bachelor until after he retired from work, when he married a Yorkshire lady and moved not far from York: accessible for the NRM. He had general railway interests and was the proud owner of a 7mm GWR “Tre Pol and Pen” 4-4-0 which was painted by Bernard Miller but I don't know who built it. On the way back from it being painted he forgot to take it home, so we were able to drool over it on the mantelpiece for a few weeks. A quiet and gentle man who always surprised with fascinating very old photographs and paperwork that I’d never seen before. I think this tender is a Hawthorn. The frame, the flare along the top, the vertical handrail, the brakes on each side of the wheels and the arrangement of the brake rods at the front all look like Hawthorn features. R & W Hawthorn built quite a few engines for the Grand Junction, the London & Birmingham and the LNWR S Div, but I think they can be eliminated - the early ones are too early and would probably have had wooden tenders or at least earlier pattern than the one in the photograph, the later ones were too big and would have had 6-wheel tenders, or Wolverton pattern, which this one isn’t. 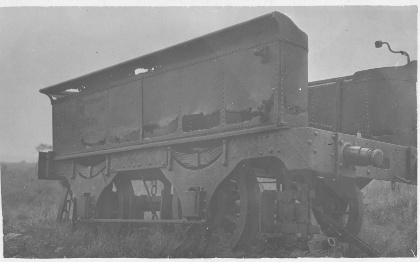 A possibility is an engine from the Whitehaven Junction, perhaps ‘Sirius’ a 14-inch cylinder 0-4-2 built in 1857, LNWR Nos 1583 and 1106, scrapped in 1870. Why Canada Works or the Southern Division are mentioned, I cannot imagine. Thomas Brassey of Canada Works was one of the famous railway line builders and built a lot of the railway lines in Britain. The Canada Works factory in Birkenhead was capable of building locomotives and turned out several hundred. So is this a tender that was built for a works engine for constructing railway lines, or was it off a locomotive built by Canada Works for the Southern Division? As far as I know there is no evidence that Canada Works (Peto, Brassey & Betts) ever built anything for the actual LNWR Southern Division. While the frame of this tender looks vaguely like the Wolverton pattern, the details aren't the same, and I suspect this vague similarity is the origin of the “Southern Division” remark on the back of the print. The Canada Works tenders whose frames I’ve seen - on the Cromford & High Peak in the 1960s — or those I've seen pictures of, look nothing like this. But then pictures showing Canada Works tenders are rare, so maybe one showing something like this tender will turn up. Until then I still think it’s probably a Hawthorn.